The Open Aerospace Engineering Journal is an Open Access online journal which publishes research, reviews, letter articles and guest edited single topic issues in all areas of aerospace engineering. The journal covers the topics related to aerodynamics, computational fluid dynamics, wind tunnel testing of buildings and structures, aerospace structures and materials, composite materials, dynamics and control, real-time data acquisition, space engineering and construction, lunar base construction, field and remote sensing and robotics. 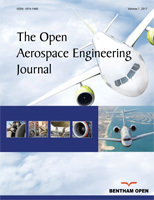 The Open Aerospace Engineering Journal, a peer reviewed journal, is an important and reliable source of current information on developments in the field. The emphasis will be on publishing quality articles rapidly and freely available worldwide.